Summary of the recommendations made in the book "Deep Nutrition" that I have on Kindle. This is not Paleo, but it's along the same lines, with some allowances for things I like: butter, cheese, whole milk. This, along with the page listing toxic fats (http://drcate.com/list-of-good-fats-and-oils-versus-bad/, already bookmarked 2018-01-30) are the pages you should send to someone looking for info on getting started on this lifestyle. It occurs to me that all large, successful industries have tapped into pre-existing (or pre-discovered) paradigms. No one is "forcing" the world to like something that becomes successful. It's a matter of tapping into pre-existing notions and telling the story that inserts your product into that tale. For example, fast food industry taps into the salt, sugar, fat paradigm. Diet industry taps into our need to believe good/evil. UPDATE 2018-05-05: Diet industry also taps into the fact that our gut bacteria is now tuned to induce processed food cravings. meetup-movnat, evolvify-topics, diet, food-processed = see the answer to "How are changes in lifestyle, food, or other things in Kenya over the last couple of decades affecting health and running among youth?" ..................... "They train with incredible heart, motivation and intensity, without any of the advantages that Americans get. Aspiring runners in Kenya get no goo, no gel, no sports drinks. They have no trainers or sports medicine experts. When people train hard for years and years, I suspect that has an effect on their ability to race compared to people who have it easier." Fish, vegetables and olive oil. "Finding a genetic basis for an organism's dietary needs suggests that different individuals may be genetically predisposed to thrive on different diets -- and that now, in the age of commercial gene sequencing, people might be able to identify which diet would work best for them through a simple blood test." counterintuitive = She talks about diets doing more harm than good throughout the talk, but at 11:00, she specifically says it. .................... cognitive-load = As one of the comments says: "Will power is limited and gets exhausted when the attention is distracted." That in itself sums up her talk and this line can be used in any walk of life. From the article: "carb-rich foods are easily over-eaten, producing a positive energy balance. The accompanying elevations in insulin cause net fat storage … Maybe all calories are calories, but not all calories are equally obesogenic." A non-dogmatic argument (proof, actually) that low-fat, high refined carb diets are deadly - and quite the opposite is what will keep you healthy. Not exactly Paleo, but close to it. "It's becoming widely accepted that fats actually curb your appetite, by triggering the release of the hormone cholecystokinin, which causes fullness. Fats also slow the release of sugar into your bloodstream, reducing the amount that can be stored as fat. In other words, the more fat in your milk, the less fat around your waist. Not only will low-fat milk fail to trim your gut, it might even make you fatter than if you were to drink whole, according to one large study. In 2005, researchers from the Harvard School of Public Health and other institutions studied the weight and milk consumption of 12,829 kids ages 9 to 14 from across the country. "Contrary to our hypothesis," they reported, "skim and 1% milk were associated with weight gain, but dairy fat was not."" Cinch that belt to cut mortality risk - Holy Kaw! Wackiest diets [video] - Holy Kaw! "When someone advises a plant based diet, the usual response is that it seems extreme. Having to give oneself a shot every morning, open heart surgery and gastric banding are considered reasonable." Not a particularly good article,but you can find more details searching on this topic. "Typical Afghan civilians and soldiers would have been 140 pounds or so as adults. And when we operated on them, what we were aware of was the absence of any fat or any adipose tissue underneath the skin," Patterson says. "Of course, when we operated on Canadians or Americans or Europeans, what was normal was to have most of the organs encased in fat. It had a visceral potency to it when you could see it directly there." Patterson explains that in his Canadian practice, where he takes care of indigenous populations near the Arctic Circle, there is a marked increase in the number of diabetic patients he sees. Nutrients needed for healthy functioning. Beegah says he usually does not eat this way. At home he wouldn't think of loading up on triple portions of fatty foods for breakfast. But traveling, being on the go, it turns out Beegah's brain isn't processing food the same way as it would if he were having a quiet meal in his own kitchen. The sensory overload can really throw off judgment or inure us to the sensation of feeling full. Scientists are just beginning to understand how this disruption works. Watched this on Netflix streaming 12/12/2010. Great film. Four common bad habits combined — smoking, drinking too much, inactivity and poor diet — can age you by 12 years, sobering new research suggests. The findings are from a study that tracked nearly 5,000 British adults for 20 years, and they highlight yet another reason to adopt a healthier lifestyle. The most convincing case for eating a healthy. 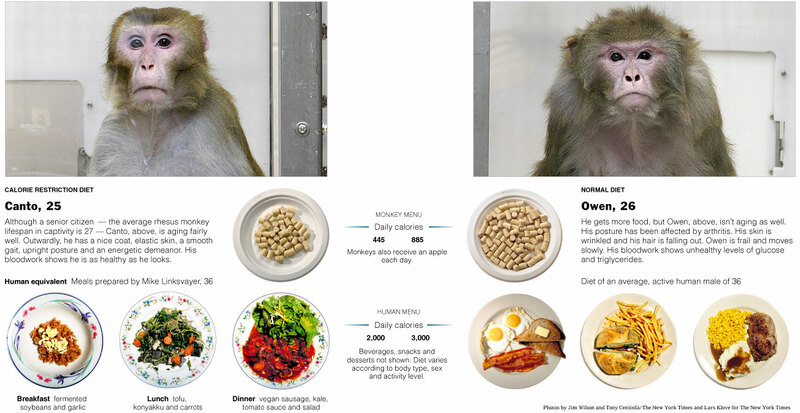 calorie restricted diet, as shown by two monkeys.